Thread: Panzer III & its variants. With my usual accuracy and knowledge I will deal this time with the tank wich was the backbone of the german armored forces until 1942 as well the variants of specializated vehicles based on it. Re: Panzer III & its variants. Hooray. Are you going to start at ausf. A and go to ausf. N, or just go in any order? That is the general Idea, with bergepanzers, artillery OP and so. Last edited by flamethrowerguy; 09-22-2008 at 06:58 AM. 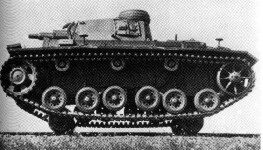 Weren't most of the medium/light tanks equiped with a tracks to rail conversion kit? They dont , the Pz III ausf n rail cruiser was a special variant made by saurer of Austria ( Ostmark for the germans) in 1942 for recce and antipartisan duties, I belive 2 or 3 were manufactured in all. On January 11, 1934, following specifications laid down by Heinz Guderian, the Army Weapons Department drew up plans for a medium tank with a maximum weight of 20,000 kg and a top speed of 35 km/h. It was intended as the main tank of the German Panzer divisions, capable of engaging and destroying opposing tank forces. 1:1 scale mock-up of the Zug Fw. Daimler-Benz, Krupp, MAN, and Rheinmetall all produced prototypes. Testing of the prototypes took place in 1936 and 1937, leading to the Daimler-Benz design being chosen for production. The first Panzer III A came off the assembly line in May of 1937, and a total of ten, two of which were unarmed, were produced in 1937. Baimler Benz was the winner in the contract for the ZW 1, this manufacter was only responsible for the automotive and hull component, turret fabrication and arming was in the hands of the giant steel works Krupp. Despite the technical armament office ( and Guderian too) asked for 50 mm main gun the K.w.K of 37mm caliber was placed instead. this fact caused unrest in the Panzer commanders, however Krupp explained that the 50mm gun was not ready for production and the 37mm gun was available in large numbers, this weapon also had the advantage to interchangeability of ammunition with the infantry Pak 36. It was powered by a V-12 Maybach HL 108 with 250 hp coupled to a 5 gear transmition, top speed was 35km and combat weight some 15,600 kg. It was the only variant using coil spring as shock dampers in the suspension, this variant is easily identificable by its 5 large roadwheels. Last edited by Panzerknacker; 09-22-2008 at 07:27 PM. Looking at the figures of the ausf A armor is obvious that that was a compromise and probably it was never intended go to war with this poor protection. Maximum thickness was 16 mm in the turret mantlet, 14,5mm plates protected side front and rear hull, deck plates were 10mm and belly plates only 6mm. The armor was vulnerable to almost everithing including the antitanks rifles of the moment ( the german Pzb 38 penetrate the front plate up to 200 m and the polish MZ 35 almost go straight side to side at the same distance) near hits by artillery and grenades. Inside turret, loader view showing gun breech and 2 MG 34. Continued machinegun fire could also cause cracks in the armor and/or jamming the turret. The main gun was the semiautomatic breech 3,7 K.w.K, percussion fired modified variant of the army pak 36. Its aiming device was the TZf 5 of 2,5x and 24 mm. Muzzle velocity of the pzg 39 ammunition ( armor piercing steel core tracer incendiary) was 745 mps. The turret movement had no assistance, turning and elevation was done manually. 2 machineguns MG 34 were carried, 2 paired in the right side of turret and other managed by the hull machinegunner. 4500 rounds of ammunition for the MGs and 121 for the 37 mm main gun were carried. Last edited by Panzerknacker; 09-22-2008 at 07:25 PM. Two more images of the ausf A, this tank belonged to the 5th panzer Regiment of the 3rd Panzer division. Isn't there an underwater variant or an experimental one? I think your talking about the Tauchpanzer III, about a dozen built for Seelowe, used in the ostfront I think. Yes, yes, all that, give me some time man. The main characteristics of these variants was the utilization of a multiple leaf springs suspension with 8 roadwheels per side, this modification was introduced probably to increased the track ground contact lenght and recude ground pressure. There were also small modification in engine deck and transmition, in other aspects like armor and armament the tanks were the same as in ausf A. The different layout of the leaf spring is one of the few things that could help precise identification of this models. Last edited by Panzerknacker; 09-24-2008 at 06:58 PM. ausf B in Poland 1939.
ausf c, note the shock dampers in first and last bogie.